We are journeying to Southern Chile to visit a Mapuche community in Nueva Imperial with Marcelo of Evoluzion. 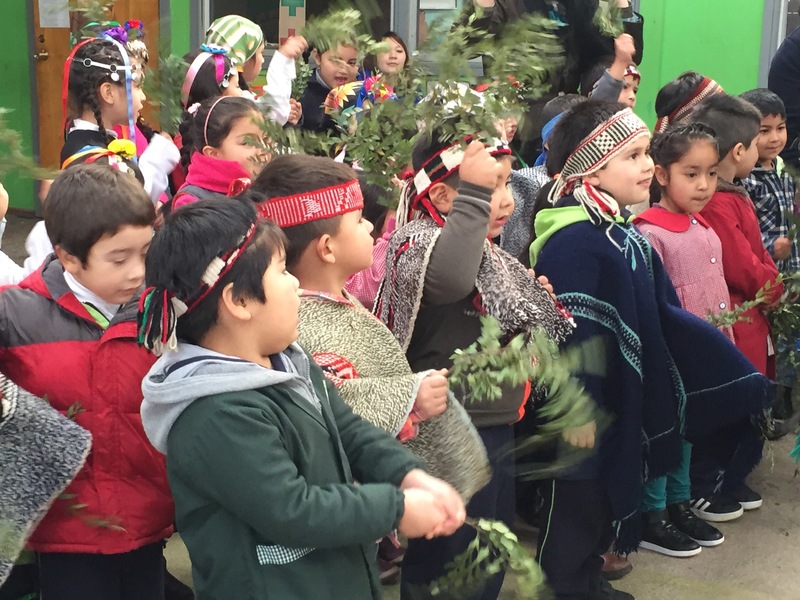 Our intention is to participate in Mapuche culture and make good relations. We are preparing to bridge people to a rich and important culture by creating an immersive, educational, tranformational travel experience in August for International Indigenous Day. 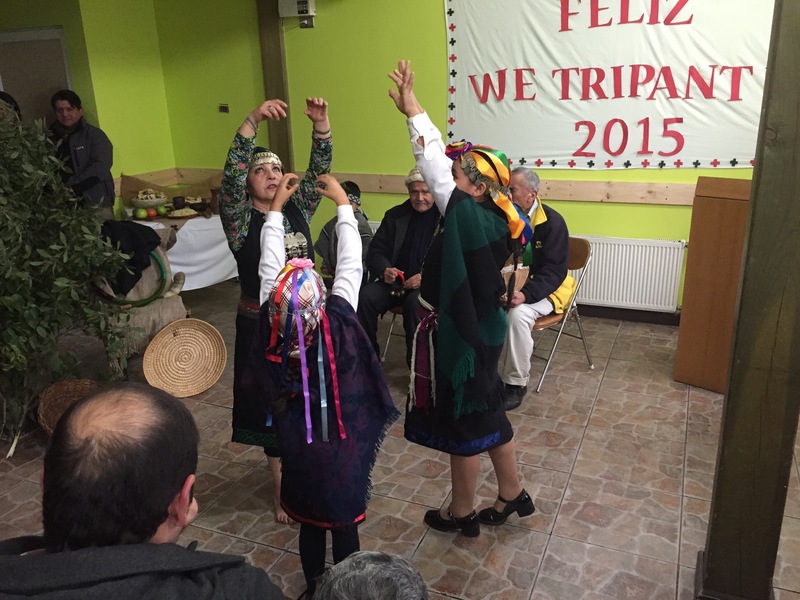 We will celebrate the Mapuche New Year, We Tripantü (new sunrise). 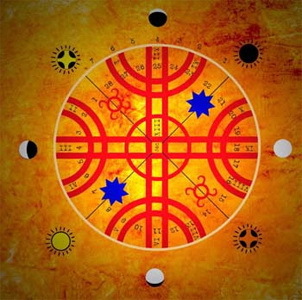 The Mapuche New Year signifies the birth of the sun and rebirth of each person. Coinciding with the winter solstice, each following day the sun shines longer and the moon glows less. Ancestrally they bathed themselves to signify personal rebirth. As we travel South, I’m feeling honored to have the opportunity to meet and learn from such a beautiful and wise culture. I reflect on the idea that the Mapuche people are one of the most resilient indigenous people because despite numerous attempts of conquer first by the Incas, then by the Spanish, then by Chile itself, they’ve fought to keep their culture and traditions preserved. Our Mapuche guides and dear friends, Onesima and her mother Luz of Pichi Newen graciously took us into their homes and guided us through Mapuche culture, cosmovision and history. Pichi Newen exists to enhance the identity of the children of the Mapuche people in the region of Araucania through traditional music, art, dance and theater. 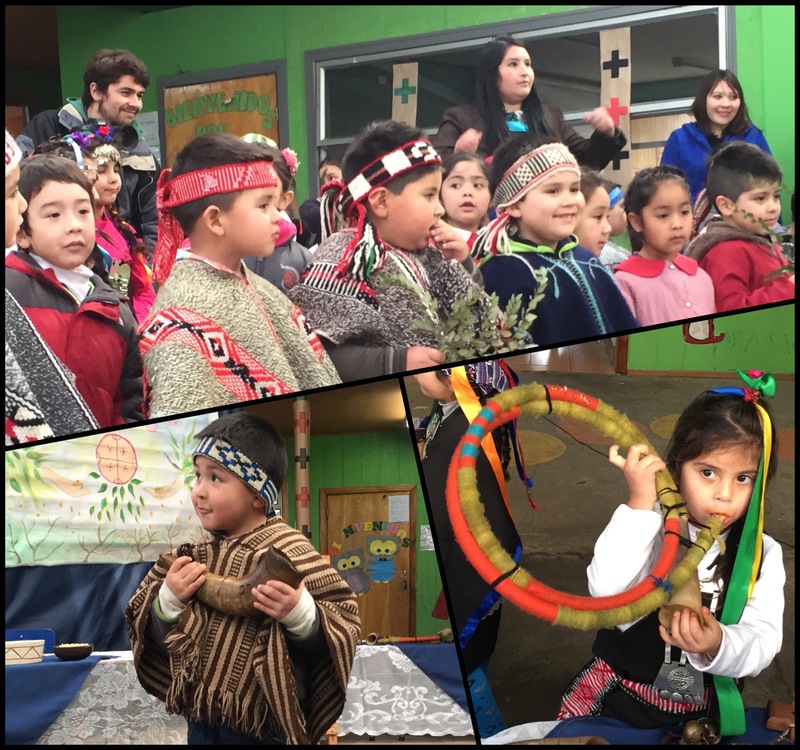 Through the eyes of the Mapuche, we could feel the spirit of their deep connection to the sun, moon and the earth. Our first lesson came from the children of one of the schools that Pichi Newen works with. 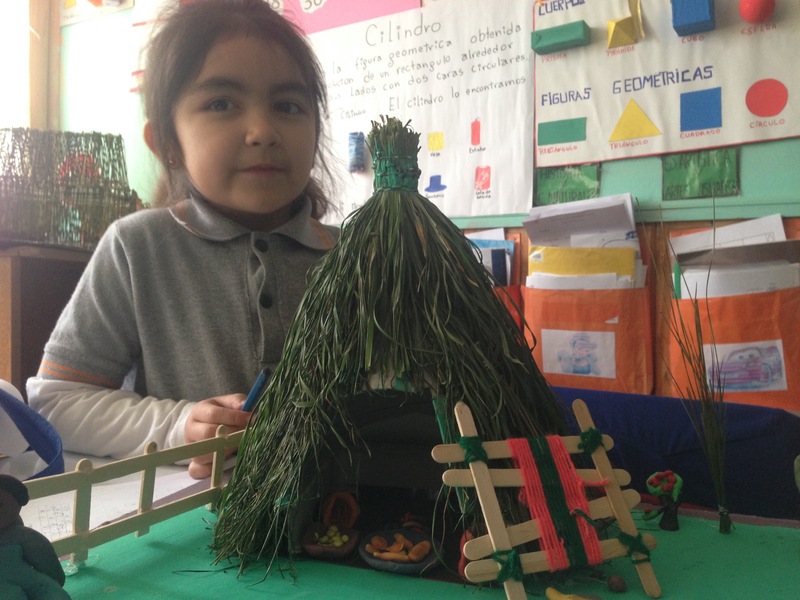 They showed us their models of traditional Mapuche houses (Ruca) made out of straw and natural materials as well as the different tools and items they use. The tradition inside the house is that the Mapuche would spend evenings sitting around the fire having deep conversations. Sweet girl in the school explaining her model of a Ruca. The next night we sat inside a Ruca around a fire with Onesima, Luz and Marcelo and continued to listen to stories and fascinating information about the Mapuche culture. Hearing the intense discrimination, and oppression that even modern Mapuche people experience in Chile was an important reminder. The Newen (energy) was authentic and the love was flowing around the fire circle like water. The morning after, our host, Luz gave us a tour of her land and all the different medicinal plants she was growing including Foye (Canelo), one of the most sacred plants to the Mapuche that is used to pray with and communicate with the spirit realm. Chile has suffered from intense lumber extraction and Luz is doing her part to bring back endangered and native plant species to her land. 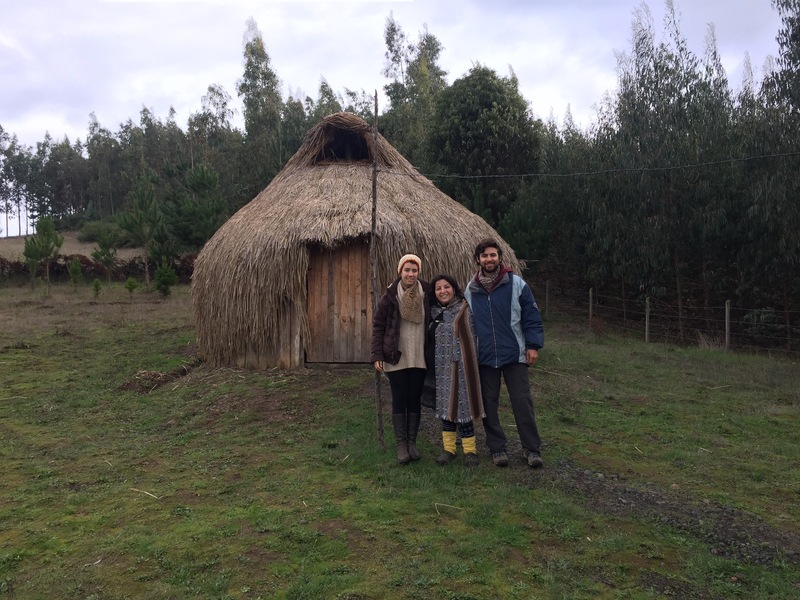 Finishing our land tour in front of her Ruca with the wonderful, Luz. 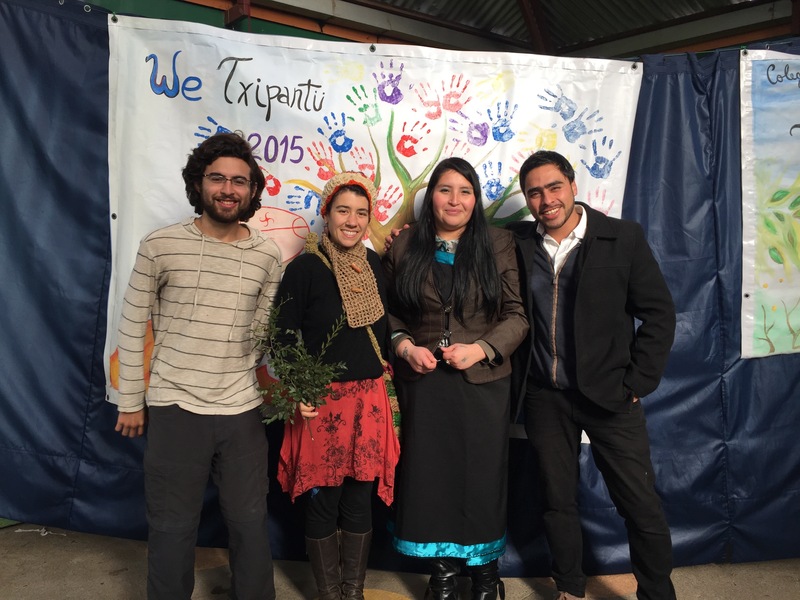 We were gratefully invited to our first We Tripantü, Mapuche New Year celebration. Beautiful songs, colorful traditional outfits and dances were shared by children, young-men and women and elders. Watching the spinning colors, old and young, sharing deep ancestral ties, I could feel myself welling up inside feeling the swirls of magnetic ancient power from the ripples of the ceremony. A beautiful dance with Luz and children to celebrate We Tripantü. 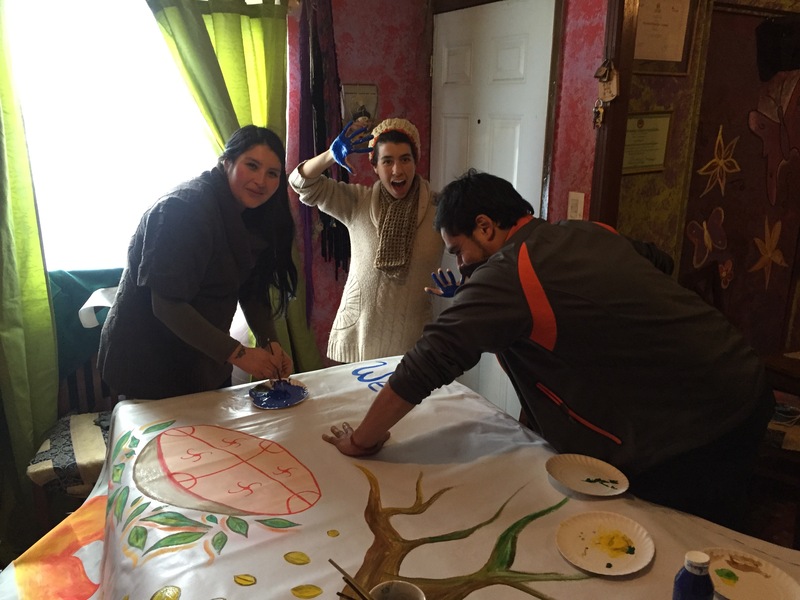 An afternoon of painting banners for Trifkantü with Onesima. Our third day was spent painting special banners and preparing for the Trafkintü at the school, which we learned the night before means “mirada de los dos” or “seeing each other”. Trifkantü is a very important ancestral meeting of exchanging of goods, usually seeds and exchanging knowledge between members of different territories to level their mutual expectations. It was truly a sacred experience to witness this important practice being brought to modern times with children and see their full dignity. Children embracing their culture, dressed in their traditional clothing celebrating Trifkantü. The magnitude of authenticity and love experienced during our visit with the Onesima and Luz was profound. To witness the struggles and see the mighty acts of prevalence to carry on this precious culture is astonishing/ and to share hugs and friendship with the Mapuche feels honorable. I’m thrilled to bring a group of people to this community in August for International Indigenous Day and open their eyes, just as mine have been opened. Group photo with our new friend and Mapuche teacher Onesima. This article has a beautiful meaning to me because what you saw in mapuche is something that our people don’t see, in Chile there is a politic of terror wich make people think that mapuche are just terrorist when they are an amazing culture. From Chile we thank you can show to the world truly meaning they have in our cultural patrimony.